Warminster: Welcome to Warminster Maltings, Britain’s oldest working maltings. 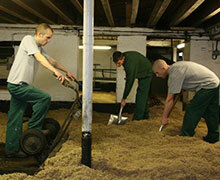 Welcome to Warminster Maltings, Britain’s oldest working maltings. Situated in the Wiltshire town of the same name, on the western tip of Salisbury Plain, the Pound Street maltings has been continuously making malt for the brewing industry since 1855. 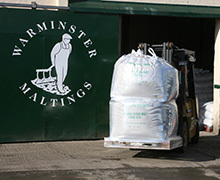 Not only that, in defiance of all the 20th century technology which completely overwhelmed the malting industry in the 1960’s, Warminster Malt is still made the traditional way, by hand, on floors, almost totally unchanged from the day the maltings was originally commissioned. Presided over by Head Maltster, Chris Garratt, this gentle, natural process prevails today because it is now widely acknowledged that this method produces a superior product particularly suited to the Craft Brewing and Craft Distilling sector. The current owner, the Hampshire based barley merchant Robin Appel, has, over the last 18 years, undertaken extensive restoration of the Listed Grade 2* complex as well as renewing or upgrading all the engineering. So it is not for no good reason that the staff at the maltings have been dubbed by their customers, and are now universally acclaimed ‘The Malt-stars of Warminster’! Simply fill in your details and we will be happy to help with your enquiry.